It was 1942 when John R. Dovin, and his wife Wanda, started the firm in a facility just down the street from where we're now located. Shortly after opening the doors, Wanda became a licensed funeral director - one of only two women at that time licensed to serve this county. They cared for the families of this community together for 50 years. Only five years after they began, John and Wanda realized they needed a larger facility. They wished to have a building that was dedicated to funeral service from the outset, having realized that using a renovated, remodeled residence was not providing them with the most ideal setting in which to serve their client families. After picking a location, they set about designing, and building the first dedicated funeral home in the county. This marked their partnership, once again, as innovative. Their son, Launey Dovin, first joined the firm as an intern. As is true with many family-operated funeral homes, Launey had become part of the business early: helping his mother and father in the day-to-day operations of the firm. He became a fully licensed funeral director in 1963. Together they grew the business, incorporating significant changes in policy and process; always with the fundamental desire to better serve the diverse population of our community. 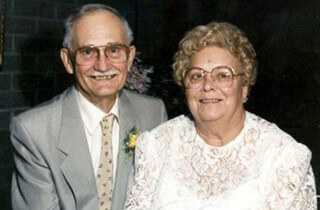 John R. and Wanda were extremely proud when their grandson John E. Dovin, the third generation of the Dovin family, joined the firm in 1988, after graduating from the Cincinnati College of Mortuary Science. The continuity of dedicated service by members of the Dovin family reflects the commitment they feel to the families in our area.